I’ve been barbecuing all my adult life. I don’t claim to be a grillmaster. I haven’t made a study of scientifically optimized barbecuing techniques. But I can usually get pretty good results. I’ve always been a traditionalist about it, only using charcoal, and always owning a primitive grill. I had a L’il Smokey in college. I had a tiny thing that fit in a backpack when I lived in Japan. Since then, I’ve always had one of those converted 55-gallon drums. I always felt that part of the fun of grilling was the unpredictability—that each time I got good results in spite of the lack of control, it was a small triumph over chaos, and my ability to get good results was evidence of some inarticulable talent. It turns out that this represented one of those unexamined assumptions that turns out to be wrong. The bottoms on those drum grills eventually rust out completely, so I’d wind up replacing them every few years. After the last one was gone, Gwen decided it was time for something different. She knew that charcoal grilling tastes better, but she also knew that gas grilling was more convenient, and can be a better-tasting option than stovetop cooling. 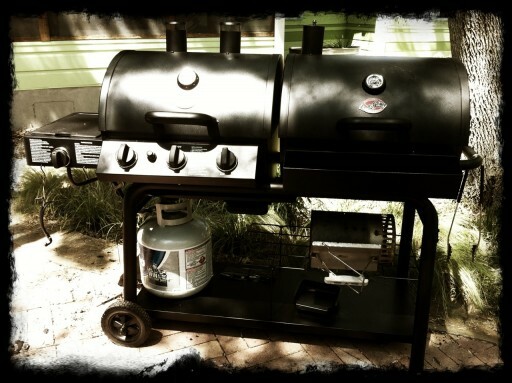 She picked out a two-way grill, with gas in the left barrel and charcoal in the right. It was on sale at the big-box store, and we bought it. This is not something I would have picked out for myself—the charcoal side alone is fancier than any of those drum grills I’ve owned. And I felt a bit odd about allowing a propane grill into the household, even though I can avoid using it if I want. We took the grill on its maiden voyage yesterday, and it immediately proved itself to be vastly superior to any grill I’ve owned before. To hell with triumph over chaos and inarticulable talent. I’ll stick with convenience, predictability, and control from now on. At least when it comes to grilling. Happy Grilling and Happy 4th, Adam and Gwen!